Mercedes SL -Class vehicles were “born to win races,” according to a brochure on the carmaker's Web site. Apparently, state troopers feel otherwise. 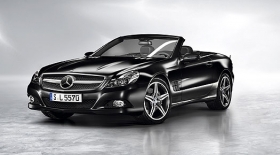 NEW YORK (Bloomberg) -- Drivers of Mercedes-Benz SL-Class convertibles are the most likely to receive traffic tickets and are cited about four times as often as the average U.S. motorist, according to Verisk Analytics Inc.
Mercedes had three car models among the 10 most-cited per mile driven, said New Jersey-based Verisk, a supplier of data to insurers. Drivers of the Toyota Camry-Solara and Scion tC had the second- and third-highest violation rates, Verisk said Thursday in a statement on its Web site. The cars on the most-ticketed list tend to attract either drivers looking for speed or younger, less-experienced motorists, Verisk said. Vehicles built to transport more people were among the least cited, with eight sport-utility vehicles and minivans among the 10 with the fewest violations. The Rainier, an SUV from General Motors Co.’s Buick, had the lowest rate of tickets. Mercedes, the luxury unit of Daimler AG, sold more cars than the Toyota Motor Corp.’s Lexus in the U.S. in September. The SL-Class was “born to win races,” according to a brochure on the carmaker’s Web site. “These are fun-to-drive cars, and sometimes people have a little too much fun enjoying them,” said Robert Moran, a spokesman for Mercedes in the U.S.
Verisk’s Quality Planning unit analyzed records on traffic violations for 12 months through February. U.S. car insurers including No. 1 State Farm Mutual Automobile Insurance Co., Allstate Corp. and Berkshire Hathaway Inc.’s Geico Corp. weigh actuarial data in setting rates for policyholders.